The Deaconess Ministry has partnered with the Reality House Women’s Shelter and would like the congregation to join them in an opportunity to be a blessing by donating diapers, wipes, and toiletries to assist families in the shelter. We are asking that you bring donations. If you have any questions please see any sister on the Deaconess Ministry. As we continue to celebrate the blessings God has bestowed upon us, all members are asked to give a sacrificial offering of $300.00 on Sunday, March 31, 2019. The Prison Ministry Training is scheduled for Saturday, April 6, 2019, 9:00-11:00 a.m., at South Baton Rouge Church of Christ 8725 Jefferson Highway. All volunteers or members that would like to be a part of this ministry must complete the training one time each year. 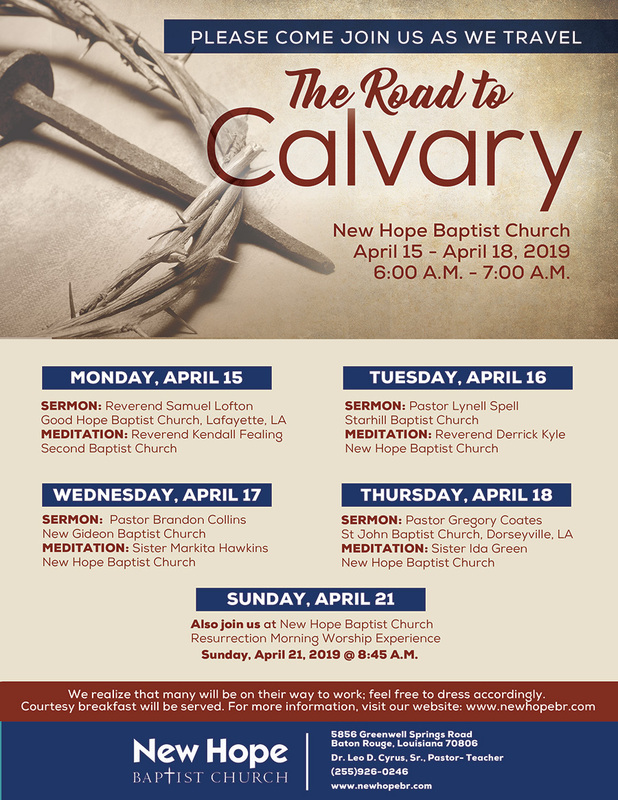 New Hope Baptist Church will host it's Annual Symposium “The Road To Calvary” beginning Monday, April 15th -Thursday, April 18th from 6:00 a.m. - 7:00 a.m. Breakfast will be served. A list of speakers is forthcoming. Our Resurrection Morning Worship Experience will be Sunday, April 21st at 8:45 a.m. There will be no Church School on that day, however, Children’s Church will be held at 8:45 a.m. and the Nursery will be open. Our Own Brandon V. Lewis has been selected out of over 200 entries to compete in the Greater Baton Rouge Art Councils Art Flow competition, which brings a $2,500 cash prize, Art Flow is a multi-parish competition that showcases local artist in various businesses and hospitals across East and West Baton Rouge. You can vote for both of his paintings that were selected by downloading the FLowBr app on your smartphone device, click the Art Flow button and select his name and VOTE. Attention All NHBC Members: All announcements, (subject to editing) intended for the Church Bulletin must be submitted to the Church Office no later than each Monday at 5:30 p.m. Members may hand deliver, fax (225) 925-8022, or email them to debrajmartin59@yahoo.com or newhope5856@gmail.com.